This week we read Pooh Loves You, by FranPosner. 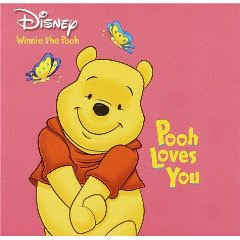 This is a cute rhyming story featuring Winnie the Pooh and the things that he loves. I though it would be fun to make a collage of the things that Emily loves to go along with the story. Emily was happy to tell me all of the things that she loves. I thought it was cute that some of them were the same as Winnie the Pooh’s!! I printed the sheet out and had Emily cut each picture out. I gave her some heart stickers to decorate it with too. When she was all finished I wrote Emily Loves…. on the doilie and labeled each picture. This is such a cute idea! Plus, it's something you can look back on when she's older and remember the things she loved when she was this age! This is SO sweet Michelle. Her finished project is adorable. She did a great job and I love the whole idea behind why you did this and how. I love the idea - and the finished project turned out beautifully. I bet you will keep it for a long time! Great teaching Mamma! When she said, "Green, because I love green," you knew she got it! Keep on creating wrinkles in her beautiful brain! What a way to make the collage personal! Very cute. This is really cute! I bet she enjoyed making it and showing it off! Great idea! I linked up with a post I put up last week. Hope you don't mind! I'd like to start doing Start again on a regular basis, but it's hard with M in school. okay- I didn't put the title of the book on the link -up! yikes! Sorry about that! That is so cute and simple. Great idea! Oh, SO cute! Maddie and I totally need to do a love collage! What a cute collage! And adorable Pooh book! What a sweet collage! I love it. This is a lovely idea you have created. I love how you have shared it with others. I have so enjoyed looking and visiting your blog. I am inspired to try some of these with my own children. I will be back for more inspired posts. We love Pooh, too. She did an excellent job cutting out the pictures! I just posted a blog post featuring collages we made yesterday featuring photos and pictures of things that Savvy and Blake love - talk about great minds thinking alike!!! I am thinking of making it an annual tradition to make one of these collages every year around Valentine's Day. Emily's collage will make a beautiful keepsake.